So everything is running ok our Client can send messages to the Server and receive a response. But what’s just happened? 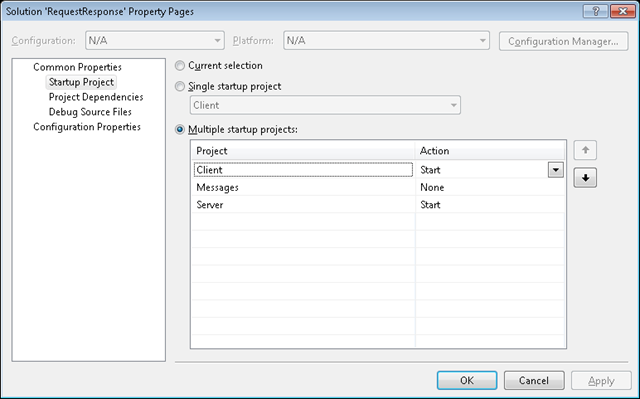 As you can see the solution is set to start multiple projects namely the Client and the Server. Now the Server and Client projects are both Class Library’s so how come they are running as console apps when we F5 (debug) the solution? Notice the Start Action is set to Start external program NServiceBus.Host.exe from the Client projects debug\bin directory. When we hit F5 to debug the application visual studio runs this exe and that’s how we get the console windows. But how does it know where to get its configuration? NServiceBus.Host.exe scans its current directory for any dlls. 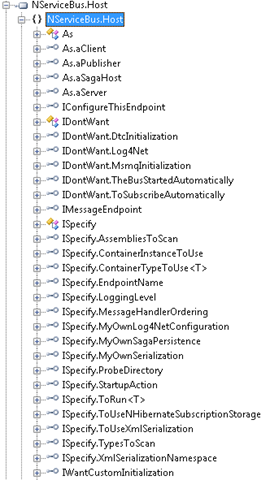 For each dll it finds it searches for a class which implements the interface IConfigureThisEndpoint. If the search is successful the Host knows to use the app.config for this dll so in the case of the Client – Client.dll.config is used to configure nServiceBus. Of particular interest, the interface used to configure the dll as a client (As.aClient) and another to specify which code to actually run (ISpecify.ToRun<ClientEndpoint>). 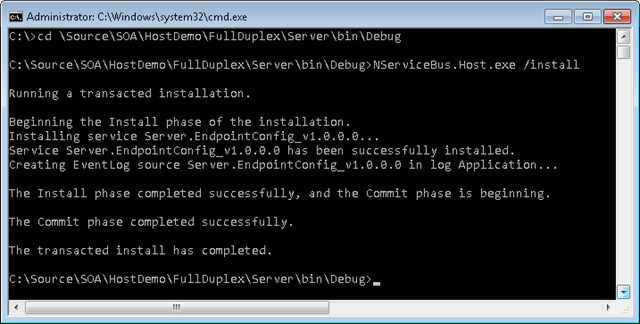 The ClientEndPoint class contains the code which is runs when the Host starts and stops. Here the interfaces are used to configure the dll as a server (As.aServer) and IWantCustomInitialization which allows you to specify additional configuration via the Init method. 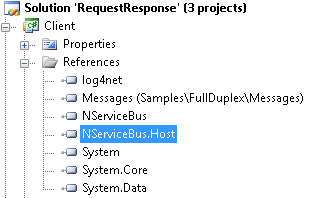 The Server project also contains the RequestDataMessageHandler class which the bus knows to use when a RequestDataMessage arrives. All this makes it very easy to create Client and Server applications for nServiceBus which are a doddle to debug in visual studio. Note: The service will not disappear from this Services management console until you reboot your machine, this is standard for a windows service. That’s as much as I have puzzled out for now, if I’ve made and glaring errors please let me know. An F5 in the Service Console should remove it.